Back Pain Migraine InfertilityArthritis Sleep disorders Hormonal imbalances Sports injuries Digestive disorders Stress-related conditions. Reflexology is suitable for all ages and may bring relief from a wide range of acute and chronic conditions. After you have completed a course of reflexology treatment for a specific condition, many people find it beneficial to continue with regular treatments in order to maintain health and well-being. While many people use reflexology as a way of relaxing the mind and body and counteracting stress, at the same time many doctors, consultants and other health care professionals recognise reflexology as a well established, respected and effective therapy. With ever increasing levels of stress, it is important people take more responsibility for their own health care needs. Reflexology helps us to cope on a physical, mental and emotional level thereby encouraging us to heal and maintain health in all areas of our lives. On the first visit, the reflexology practitioner will have a preliminary talk with you to determine your present and past health and lifestyle. The reflexologist will then use their hands to apply pressure to the feet. The application and the effect of the therapy is unique to each person. A professionally trained reflexologist can detect subtle changes in specific points on the feet, and by working on these points may affect the corresponding organ or system of the body. A treatment session usually lasts for about one hour. A course of treatment may be recommended depending on your body’s needs. After one or two treatments your body may respond in a very definite way. Most people note a sense of well-being and relaxation; sometimes people report feeling lethargic, nauseous or tearful, but this is transitory and is a part of the healing process. This is vital information to feed back to the reflexologist as it shows how your body is responding to treatment. This will help the reflexologist to tailor a treatment plan specific to your needs. Reflexologists apply pressure on “reflex zones” found on the feet and hands which are said to correspond to the different parts of the body. Application is done through thumb, finger and hand technique. Reflex areas, like hand and foot, composed of 7200 nerve endings are stimulated by pressure applied. An improved instruction to every gland, single part and organ of the body could be achieved by such a health science. The body is then believed to pursue a biologically correct, strengthened and reinforced state. The reflex zones are organized in a way that represents the whole body. First of all, there should be a preliminary talk with the practitioner before treatment. 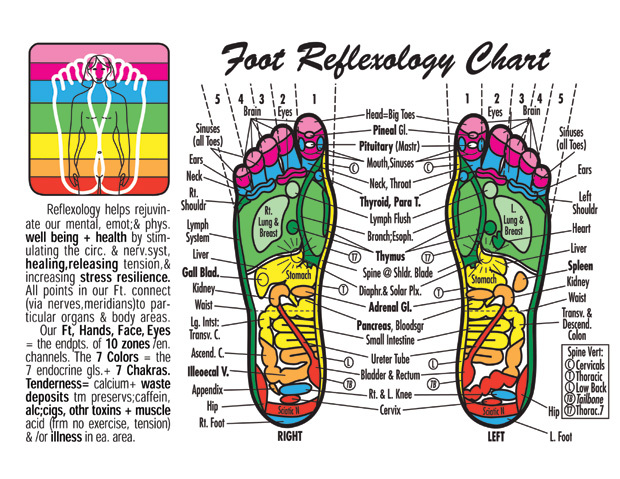 The reflexologist then begins to work on the client’s feet, or hands if necessary, noting problem areas. There may be discomfort in some places, but it is fleeting, and also an indication of congestion or imbalance in a corresponding part of the body. For the most part, the sensation is pleasant and soothing. Reflexology can help relax the client and is believed to stimulate the body’s own healing mechanisms. Usually a treatment session lasts for about one hour. For some cases, a treatment can last nearly two hours. A course of treatment varies in length depending on the need of the client body. The reflexologist will discuss this with the patient at the first session.